I've been putting more and more miles in the saddle for R&D work and have one horse that is hard to fit. I decided to purchase a new custom fit saddle from Synergist Saddles in order to get a saddle that fits the horse better. I did my first ride in the saddle and pad this A.M. and was very happy with the results. My horse seems to move better and was happier going down the trail. I'll post more after I put some time and miles on the saddle. Brian and I have been over in Asia for the last week meeting with our hoof boot and saddle pack vendors. It's been a good week. The majority of our molds are done for our next generation of hoof boots. With the molds complete it gives EasyCare the opportunity to move to the next stage and do a bunch of hands on testing. We have some great stuff coming and I can't wait to get back and put these finished designs to the test in the Colorado mountains. I don't have any release dates yet. Release dates will all depend on the success of early testing. 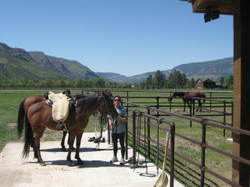 Our horses are back in Colorado for the summer months. Our Colorado property is much different than the Arizona property and I've have seen a huge change in the horses feet in the short time since arriving. The feet are much more difficult to manage here. Spending the summer months in Colorado has really been a huge benefit for product testing. It's given me the ability to ride in a much wetter environment. Most of the rides from the house have multiple creek crossing, sections of deep mud and I can ride in the snow just about all summer if we climb in elevation. I'm currently testing some new gaiter designs for the Easyboot Epic and Easyboot Bare. I'm also testing multiple Easyboot Glue On Shells. Here are a couple photos from our ride today. Both of the horses were booted on the front feet with Easyboot Epics and a new prototype gaiter. I removed the eight Easyboot Glue On Shells today. It's been roughly ten days since I fitted the horses in the boots. All eight boots did a tough 55 mile endurance event and a couple long conditioning rides. I would say the boots now have close to 80 miles on them. Ten days is a little longer than I intended to keep the boots on but with travel and Mother's Day I didn't get to them after the race. Even at ten days the feet looked wonderful and there was very little moisture inside the shells. I'm using a combination of foam and glue on the bottom to lock out the moisture. Removing the boots took a little strength and technique. The glue bond between the hoof and boot was still very solid and took a bit of work. The photos below are not a boot. 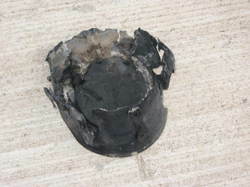 The photos below are of the glue that was between the hoof and glue on shell. The photos were taken immediately after I removed the shells. 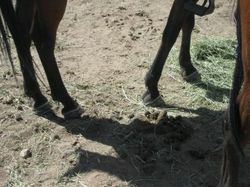 Take a look at how clean and dry the glue bond is that was touching the hoof. After the Tall Pines post I've had a bunch of requests for more details on the Easyboot Glue On Hoof Boot. 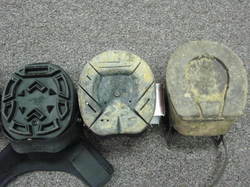 The boot is still in the concept stage but we are moving forward with some new molds that will be finished very soon. I'll post more when we are getting closer. I've attached an additional photo from the Tall Pines ride showing a side profile. What's the best way to spend Mother's Day? Go to an endurance ride with your Mom, rough it in a tent and ride a hard 55 miles together. Yes, Mother's Day is a week away but it was still a blast. My Mom and I did the 28th annual 55 mile endurance ride on Saturday. I did this ride several times as a junior in the 80's and several times in the late 90's and again in early 2000. It was great to go back and see all the familiar faces. 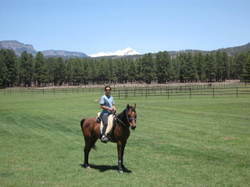 Tall Pines is a wonderful ride put on by the Trinkle and Kinter families. 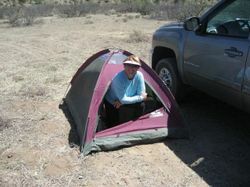 This year was the second year of a new base camp in a flatter, less hilly area. I thought the ride would be easier than the old trail but boy was I wrong. The first loop was relatively easy with good footing but was every bit of the 26.5 miles listed on the map. We set off on the second loop assuming the same. The second loop was roughly 15 miles and ended up taking around 4 hours. It was super hilly and the footing was brutal. It's one of the toughest loops on any ride. 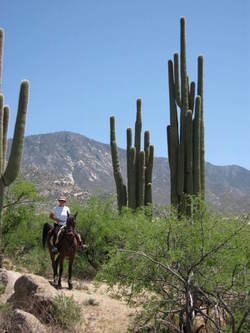 The third loop had good footing but the long sandy washes challenged the horses. We ended the day 8th and 9th and were both happy to complete a challenging event with healthy, sound horses. I've been working on several new boot styles that are testing well on conditioning rides from the house. EasyCare has a great deal of new products in the hopper right now and it's time to really put some of the new stuff to the test. This weekend I tested eight Easyboot glue on shells for the 55 mile event. The boots are a combination heat and glue fit and after application fit the hoof like a second skin. They are sweet. The shells, materials and glue are still in the R&D stage but I believe they will be part of the EasyCare product line soon. The boots fit so well it's hard to even see them. 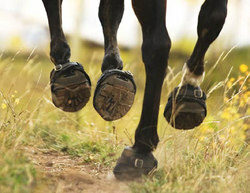 Many people thought our horses were barefoot (including some of the vets). Take a look at the photos below. Are the horses booted or barefoot? Hard to tell isn't it. Every horse shown in this post is booted on all four feet. My Mom and I did a long test ride today. The weather is perfect this time of year and with the longer days it's given me an opportunity to get all the horses out on a regular basis. 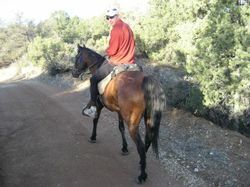 I've been riding 4-5 times per week in order to put miles on new hoof boot designs we are working on. Some of the designs will be new to the market place and some are improvements to existing EasyCare designs. I'm lucky to live in an area where I can ride hundreds of miles from the house without loading the horses in the trailer. The majority of the trails are single track but there are also two track roads and sandy river beds. 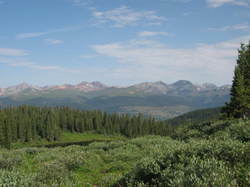 Many of the upper trails still have a great deal of water running. In 15 miles we can go from 2,000 feet to 9,500 feet. It's a perfect hoof boot testing environment. On todays ride we tested 4 new prototype Easyboot glue on slippers that are showing great promise. 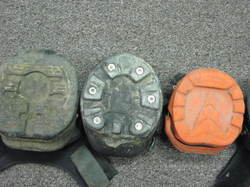 In addition we tested 2 prototype "Easyboot Stretch" boots and 2 Easyboot Epics that have been streamlined and improved. It's been a busy year in the R&D side of the business and several new hoof boot projects continue to moving forward after promising initial testing. We have been working on new hoof boot molds, new tread patterns, new fastening systems and improvements to our current hoof boot designs. A great deal of these new designs have forced me to spend more hours on the back of a horse. Riding before and after office hours helps to quickly advance these new designs and promote new ideas. Thanks for the patience on our new hoof boot designs. I believe our customers are going to very impressed with the new products, performance, price and availability. 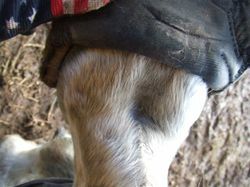 Over the years EasyCare has experimented on several occasions with glue on and foam on hoof boots. Neel Glass, the inventor of the original Easyboot, did a bunch of work with glue on boots back in the 1980's. Over the past couple months I've been experimenting with different types of adhesives, different shell designs and different application techniques. The process/concept is still developing but I'm seeing positive results and several areas where they could benefit horses. We have submitted the provisional patent work for one of the designs that I believe is very unique. I've attached a photo of Cyclone fitted in four of the concept boots. EasyCare is working on a couple new hoof boot designs and we are looking for comments, suggestions and feedback regarding what type of sole design we should use. 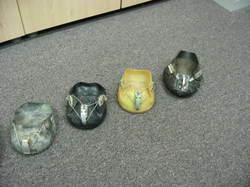 I've posted several photos showing what is available in the hoof boot industry now. What do you like? What don't you like? Suggestions? 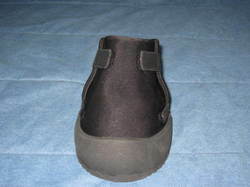 EasyCare has been hot and cold about adding a Therapy/Medical boot to our hoof boot line. In addition to developing our own boot we had some discussions with the people at Soft-Ride to see if we could team up in any way. We couldn't come to a meeting of the minds with Soft-Ride and ended up putting our design on the back burner because of the Easyboot Edge and another riding boot we have in the works. Putting our Therapy/Medicinal boot on hold ended up being very positive because the extra time allowed us to go in a new direction that will help us bring a very unique boot to market. Our Therapy/Medicinal concept currently has the following characteristics. 1. Very light weight. When complete I believe each boot will be below .40 lbs. 4. Will accept EasyCare Comfort pads. 5. Very cost competitive compared to other therapy boots. 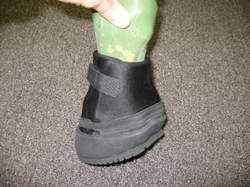 We still have a bunch of R&D to do but it looks very likely that we will be releasing a Therapy/Medicinal boot in 2008. 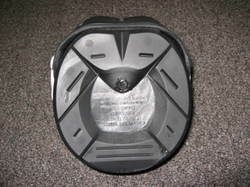 We are working on several new gaiter designs for the current Easyboot Epic and Easyboot Bare. The designs are now down to 5 different prototypes and we will now work through each to determine what gaiter will be in the 2008 inventory. Regardless of which version we choose I believe we are making a large step forward. 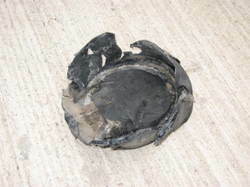 I have filed for provisional patent protection on one of the designs and materials used in the design. It's not only unique but makes both the Epic and Bare much easier to fit and remove. I have had a bunch of personal questions about the two boot photos released in my blog over the past couple weeks. I have listed five of the questions below. 1. I don't understand how the boots will stay on? 2. When will the boots be available for purchase? 3. Can I help test the new boots? 4. How will the boots work, I can't understand how they will work from the photos? 5. Can I trade another style of hoof boot for one of the new designs? Without going into too much detail here is what I can tell you. 1. The photos only contain the shells of the boots. No fastening systems or hardware are pictured. 2. We will release both boots after we are happy with the hours/miles of testing. This could be as early as January. 3. Boots are being tested now. Boots will be sent to our next level of boot test riders and will be seen at some major endurance rides in the next 40-60 days. 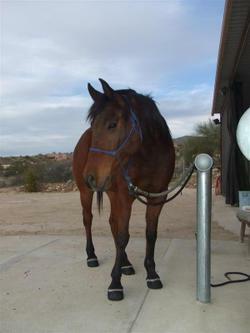 If you want to help EasyCare test hoof boot designs please apply for "Team Easyboot". 4. The photos were intentionally vague. We are still working on provisional patents and need to make sure we protect the IP in each product before more info is released to the public. 5. Programs that will allow you to trade your old EasyCare hoof boot for one of the new EasyCare hoof boot designs are currently being discussed. We want to make sure we reward EasyCare customers and give them an incentive to stick with our brands. I've been trying to collect all the different hoof boots over the past 15 years. Not only have I made it a point to collect all the hoof boots manufactured outside of EasyCare but I've tried to collect each version of boot manufactured by EasyCare. I find it interesting to see how each product has evolved and try to determine what caused each design change. 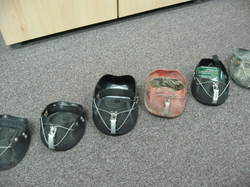 I have attached a couple photos showing the evolution of our Easyboot. 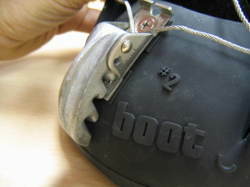 The photos show the first concept boot designed in the late 1960's to the present day Easyboot. Although it may not look like a great deal has changed over the years, each boot represents many years of processing customer feedback and making improvements based on the customer feedback. The original concept is very close to the current design but buckles, cables, Inside straps, shell heights, hardware, shell materials, shell shapes, cable containment systems and colors have all changed. I'm over in Ningbo China visiting the factory that does our hoof boot manufacturing. The new molds are looking great and we were able to work through some last details for our two new boot designs. 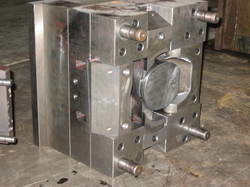 Both designs and molds are more complicated than what we have done in the past. 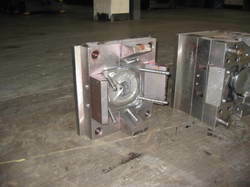 I have attached a couple mold photos to show the 1,000 Lbs of steel involved in making a mold. 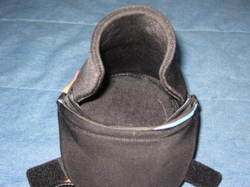 We have also made a great deal of progress on a new gaiter design. It's amazing to discuss designs, modify drawings and produce new samples during a morning meeting. Different profile, different materials and different manufacturing techniques. I'm convinced the new gaiter design will be a huge step forward in hoof boots. Dome Pads were on the lunch menu today. Check out the photos below. 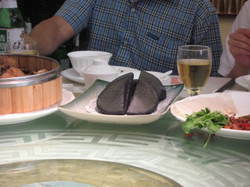 Not sure what we were eating but they sure looked like dome pads. EasyCare is working on a couple new gaiter designs that are testing well. We are currently experimenting with different materials and size configurations for the Easyboot Epic, Easyboot Bare and Easyboot Grip. 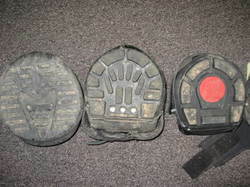 All three of these hoof boot designs will have an improved gaiter for 2008. I personally used four of the new gaiters at the XP event a couple weeks ago and have continued testing the same four gaiters at home. 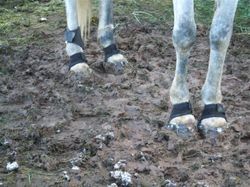 The gaiters are working extremely well, have not rubbed any of our three horses and make the boots easier to fit. The horse (GE Cyclone) I rode the third 50 mile day of the XP event was borrowed from a friend and we had just pulled his shoes 10 days before the event. Not only did the horse take to barefoot in the 10 days, we placed 8th and won best condition. The new gaiters held the boots securely in place without causing any rubs or discomfort. 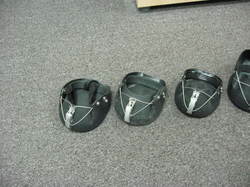 We are making some very nice progress on new EasyCare hoof boot designs. In addition to two new hoof boot models we will be making improvements to the Easyboot Epic and adding Comfort Pad styles. Look for the new boots being tested at local endurance events very soon. 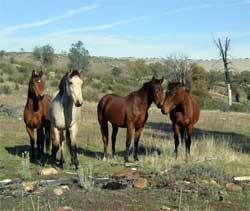 I was just presented with the opportunity to go into a wild horse area located on a large piece of private property. I couldn't pass on the opportunity and can't wait to take photos of the horses, horse's feet and environment the horse's live in. I'll post more about the experience after I go. 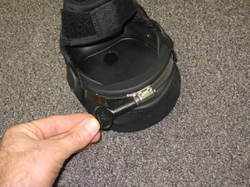 I'm planning to use what I learn to put the finishing touches on the new Easyboot model sole design. I spent Tuesday and Wednesday of this week working on two new hoof boot designs. I just got my hand on updated models of both of our new designs. I have to say I'm very happy with the boots and performance. Both models will be added to the EasyCare line in the near future. I had a great day testing new EasyCare hoof boot designs at 11,000 feet. 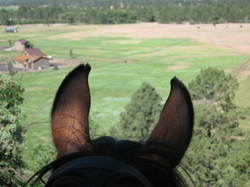 I trailered my horse Spyder to the Crater Lake Trail and went up to Crater Lake and back. The parking lot had a great horse trailer parking area, hitching posts and bathrooms. 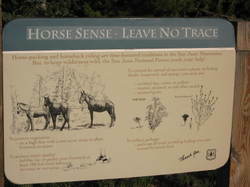 It's one of the best horse trail heads I've been to. The trail was incredible! 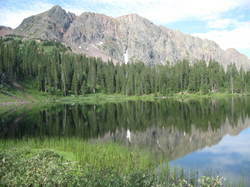 Lots of small creek crossings, aspen trees and high mountain lakes. The footing was very rocky in places and muddy in others. Turned out to be a perfect trail for hoof boot testing and I was very happy with the performance of our new designs. I had an interesting ride today. 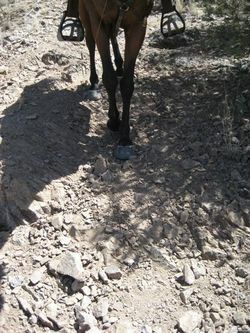 I fitted Spyder with 4 of the new EasyCare Hoof Boot designs and hit the trail. I'm using a new helmet cam to help record some video and capture fitting sequences when I'm alone. I hope to have some of that video up soon. I ended up running into a familiar face on the trail. 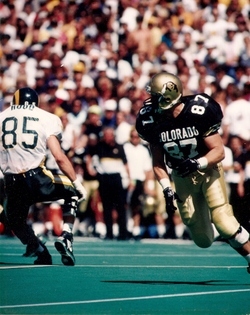 I ran into one of the athletic trainers from the University of Colorado (I played football at CU from 1990 to 1993). It was one of the moments when you know a face but you don't know from where or when. We talked about old times and he couldn't believe how much weight I lost. I did a bunch of endurance riding when I was a kid and actually completed Tevis twice as a junior. I got away from the sport of endurance riding during my college football years as I was too heavy and bulked up for a horse to carry me. After college I started running ultra distance events to lose the weight and I went on to run the Western States 100 mile run in 2000. The Western States 100 Mile Run is over the same course as the Tevis Cup 100 mile horse event. I'm very proud to be one of the few people with a both a 100 Tevis (4) and Western States (1) buckles. 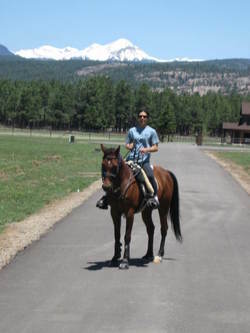 The photo below shows why most horses didn't want to carry me over a 50 or 100 mile endurance course. I have been able to accomplish a bunch of hoof boot testing over the past 10 days. In addition to my testing, Karen Chaton and Dave Rabe tested a new Easyboot Epic Gaiter this weekend at the Strawberry Fields Forever Ride. Both riders completed all three days with the gaiters. 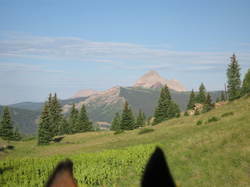 On one of my recent testing rides I took Spyder to a rocky overlook above our new property. The new boots worked great and are holding up very well in the rocks. EasyCare has some exciting concepts in the works. 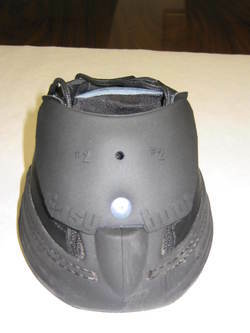 We have received several e-mails asking about the rumors regarding a new EasyCare hoof boot design. Without going into a bunch of details the rumors are true. I have been working on a new hoof boot concept that uses some of the principals from EasyCare's existing boot lines (Easyboot, Easyboot Epic and Old Mac's), competitors boots and other athletic boots. The new design is low profile, easy to fit and very secure. I believe it will also have a very attractive price point. If my blog posts slow it's because my time over the next couple months will be dedicated to getting this new design to market. I'll try and keep you updated along the way. Gotta run, I'm off to the airport to pick up an engineer that is helping with the new "Easyboot Light" design. I've been working on a new hoof boot design that I believe is a huge step forward for EasyCare. I haven't finished the patent work yet so I can't go into much detail. Here is what I can tell you. 1. I believe the concept is unique. 2. The boot is lighter in weight than our current models. 3. The boot fits lower on the hoof than our current models. I hope to have the patent work done by the end of March and will start sending prototypes out to our field testers. I think Easyboots are breeding in my tack room. Every time I go into my tack room I have more and more boots sitting around. New boot designs to test, boot designs that have been tested but need more miles, boot designs that have failed but can't be thrown away and competitor hoof boots (received through the Competitive Hoof Boot Upgrade Program) that I continue to test. Based on this ever increasing hoof boot population, I think I'm going to name a new boot design the Easyboot Rabbit. The photo below is after 30 minutes of clean up and organization. 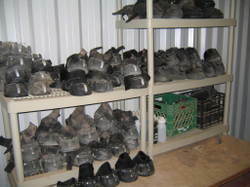 It doesn't show the boxes of boots that have been archived. 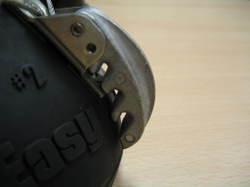 The new Easyboot Cast Buckle is complete and in the testing stages. The new cast design has flowing radius edges and is much more gentle on the Easyboot cable. The new cast design will be a major improvement to the current buckle system. In addition to the cast buckle we have another buckle up our sleeves for 2007. The patent process for the new system has been filed and the new system will be available soon. This new patent pending fastening system really takes the EasyCare hoof boot designs to a whole new level! Here is Karen riding through a boot sucking mud puddle. Click here to view the video. The Easyboot Epics stayed in place for Karen and Chief all day during these nasty conditions. 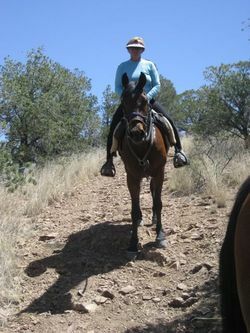 Karen Chaton and several other riders are using EasyCare hoof boots at the Grand Canyon XP 5 day Endurance Event. 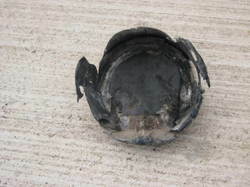 We have been using these 5 day events to test new designs (buckles, fastening systems, gaiters and tread patterns). 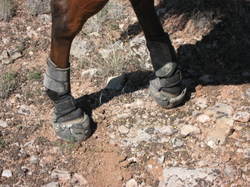 I believe that a hoof boot design that allows a horse and rider to cover 250 miles of rough trails will work very well for most other equine disciplines. 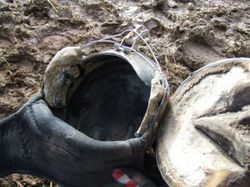 Many of the other hoof boot manufactures don't recommend their boots be used for endurance riding (That should raise a big red flag for buyers). The weather at the event has been nasty to say the least. Riders and horses have been riding 50 miles per day in constant rain, hail and snow. Conditions are bad, trails are slick and many of the riders are opting not to ride. The riders and horses that have finished the first two days in these conditions are some of the toughest horse and rider teams in the sport. Most sane people don't ride in these conditions. Karen and Dave Rabe are both using the new boots with the aggressive tread patterns. 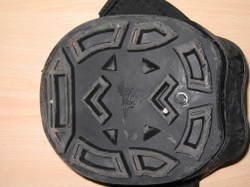 Karen has reported that the tread is working very well with very little slipping. It wasn't our intention to use the new tread at the event but the conditions have been so bad Karen and Dave thought the boots would really help. 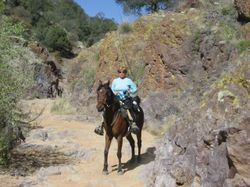 Here is a short movie of Karen and Chief working their way down a slippery, muddy section of trail. Click here to view the short clip on YouTube. Karen sent a couple of photos of her taking the boots off Chief after 50 miles of mud and muck. I was totally blown away with how well the boots worked. The feet are still clean. The pasterns are clean. What an incredible test in these conditions. Check out these photos below. I had the opportunity to use the Easyboot Mudder (or whatever the name ends up being) this weekend up in the muddy mountains of Colorado. 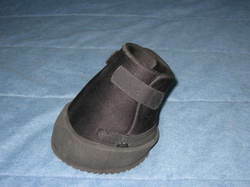 The boot has been a big hit and we have had over 800 names submitted for the EasyCare Name the Boot Contest. We had 4 days of steady rain and snow which allowed me to use the boot in very sloppy conditions. The boot performed very well and I could see a big difference in traction and performance. I cleaned up the boots today to check out the wear of the new tread pattern. Although the aggressive tread is going to wear much faster than our traditional tread patterns, I was very happy with the wear after two days of riding. 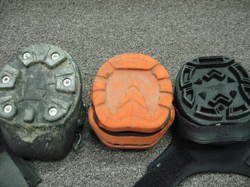 If the boot is used in wet and muddy conditions as intended, consumers will be very happy with the wear. The boot below was used for two days of the photo shoot. We didn't do big miles but probably covered 10 miles over the two days. I have been working on a boot that is basically a cross between the Easyboot and Boa Horse Boot. Now that the patent work has been submitted, I can get some out for testing. The boot works really well and should have a great price point. 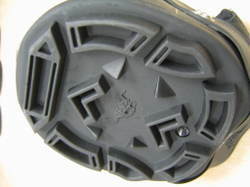 Several of the other boot manufacturers claim to have the perfect tread pattern for all surfaces. 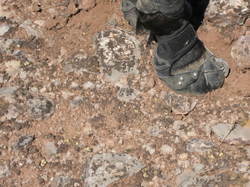 They claim that their tread patterns do well on rock, sand, mud, wet grass, pavement, etc. I personally don't buy it. That is like saying one car tire is perfect for all types of conditions, or all human shoes should have the same sole traction and pattern. 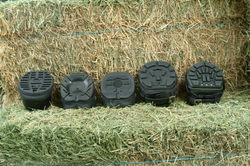 The current line of EasyCare boots have several different types of traction patterns for different conditions. I have been working on and testing a couple new tread patterns for 2007. Here is an aggressive pattern for wet grass and slippery mud. 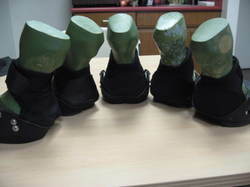 EasyCare manufactures 6 different hoof boot styles with different sole patterns. I often get the question "why do you have different sole patterns"? We do different sole patterns for different conditions. If you ride in a wet muddy area its best to have an aggressive sole pattern. If you live in a dry rocky area a less aggressive pattern is best. 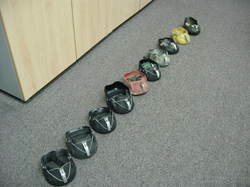 Here is a photo showing the current sole patterns. Left to right. 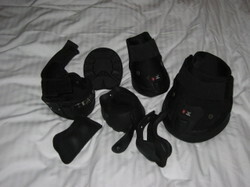 Boa Horse Boot, Easyboot Bare, Easyboot and Easyboot Epic, Old Mac's G2 and Old Mac's Original. 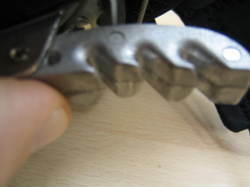 Aggressive traction is bad in dry environments and can cause lower limb problems. Less aggressive patterns are great for dry conditions but can be slippery in mud or grass. I personally prefer the less aggressive patterns in wet or dry conditions. In wet conditions I just ride a little more conservative.